At Great Higham Barn and Cottages, there are a million different ways to spend your day. 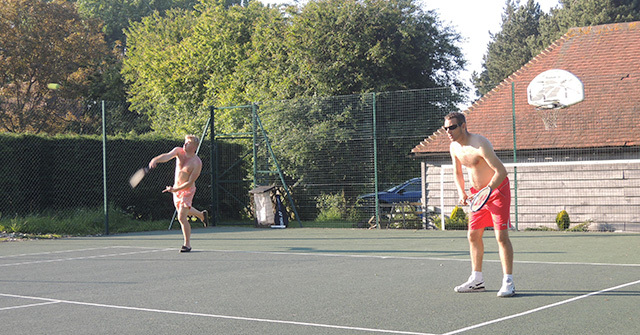 From taking a dip in the swimming pool to working up a sweat on the tennis court, there are plenty of options for those looking for an active holiday. If you prefer a slower pace of life, why not take a quiet walk through the woods or enjoying a book in a beautiful setting? The miles of paths and bridleways surrounding our cottages are all available for you to explore and we have bikes to hire for an outing even further afield. Great Higham cottages come complete with a purpose built cricket pitch, perfect for a friendly (or competitive) match, please let us know if you would like to book this for your party. Spend some time together around the on site BBQ or test your nerve clay pigeon shooting - there is such a lot to do, you’ll be spoil for choice!